DNS (Domain Name System) is a system that enables humans and computers to communicate easier. Humans use names, computers use numbers, and DNS comes in between to match the names with the numbers within a specified list. You’re probably thinking about the Contacts application on your smartphone, right? Basically, DNS is a system of distributed databases in the network with the primary function to translate the request of certain hostnames into specific IP numbers that computers understand. The information about specific hostnames matched with specific numbers is kept in the directory. The directory is stored on domain name servers. Now, let’s get started to learn more about the way DNS works. DNS works within steps and goes through DNS structures. The steps start with a DNS query, a request for information. We will use the scenario of searching for information using our web browser by typing a domain name (for example, www.google.com). At first, a DNS server will look in filehosts – a plain text file of the operating system that is responsible to map hostnames to IP addresses. If no information is found, it will search the cache – a hardware or software component that stores data temporarily. The most common place of caching is in web browsers and Internet Service Providers (ISP). The result of this simple step is an error message if no information is available. Having a scenario that a query is sent in a recursive way, a server can query other servers to fulfill the request on the behalf of the client (browser). That’s what is called a DNS recursor. It is like an agent that works hard to make every information request available. The effort for getting the information includes calling a Root DNS Server for help. Root DNS Server, also called root nameserver, is in the utmost level of the DNS hierarchy. It has no formal name and is labeled with an implied empty string. You can imagine it as a bank of reference. In practice, a DNS recursive resolver will pass on request to a Root Nameserver. Then, the server will respond to the request by telling the agent to go to more specific places, that are top-level domain name servers (TLD nameserver). When you want to access Google or Facebook, you will end the domain names with the .com ending. It’s one of the top-level domains. A server for this type of top-level domain is TLD nameserver. It is responsible for managing all the information of a common domain extension. 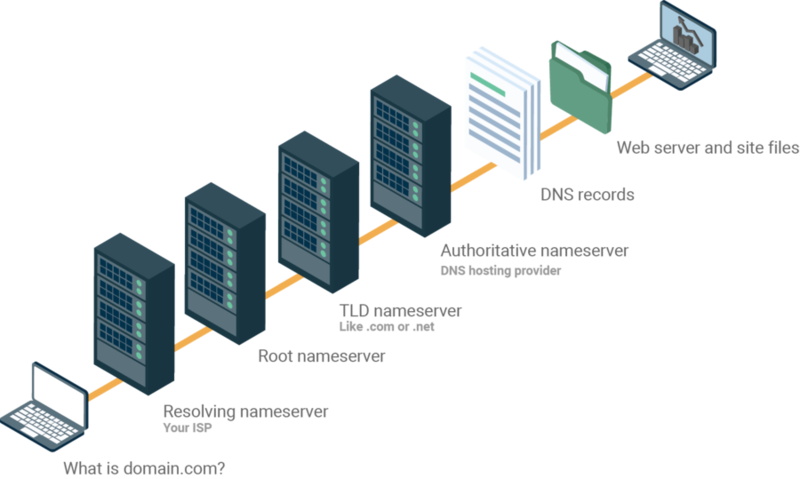 As with request of information about www.google.com, the TLD .com as a mere delegation will respond the request from a DNS resolver by referring to an Authoritative DNS server, otherwise called Authoritative Name Server. This is the one which has original resources for that domain. When a DNS resolver meets an authoritative nameserver, that’s when it happens. The Authoritative nameserver has all the information of the domain name it serves. It can give a recursive resolver to the IP address that the server found in the record. How to Change DNS Settings for a Domain? Changing the DNS setting on your Hostinger control panel is simple. You just need to login to your control panel on your Hostinger account and access DNS Zone Editor section. In DNS Zone Editor, you will see DNS record types that you can edit, add and remove. A basic DNS record where you can add new Host, TTL (Time to Live), Points to. A record for an alias for another domain where you can add new Host, TTL (Time to Live), Points to. The record to identify the server that handles your mail where you can add new Host, Priority, TTL (Time to Live), Points to. The record that allows you to have text information where you can add new Host, TXT Value, TTL (Time to Live), Points to. The A record for IPV6 address where you can add new Host, IPv6, TTL (Time to Live). The DNS server records for your domain where you can add new Host, TXT Value, TTL (Time to Live). The record for a specification of data in the Domain Name System where you can add new Priority, Name, Weight, Port, Points to, TTL. 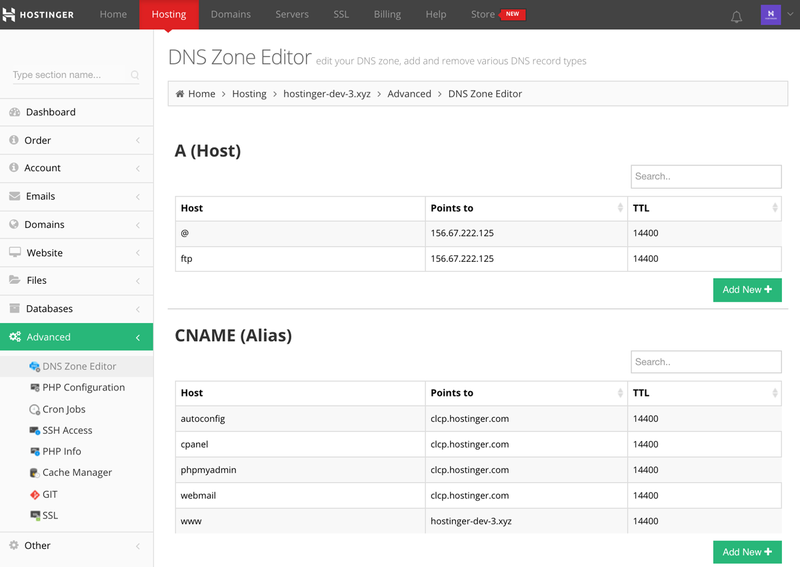 Have a look at How to Use Hostinger DNS Zone Editor for the detailed process to make you understand easier. Well, you have learned what is DNS (Domain Names System). By understanding the way it works, you also can do some changes in the Hostinger control panel settings to suit your need.